I don’t know what I was expecting from Budapest, but what I found was not it. It has a real feeling of grandeur. The architecture is stunning, if not a little tired in some places. 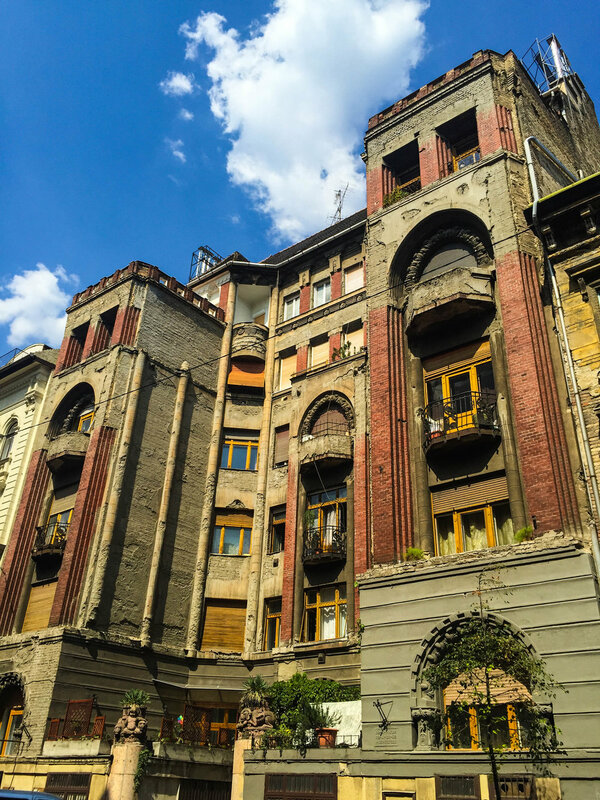 The buildings are imposing in stature, but still have a warmth in their spirit. There is a lot of greenery in the city too, which is a nice change compared to many of the European cities we’ve visited. Once two cities, the two sides of Budapest (pronounced Budapesht), Buda and Pest are separated by the Danube. 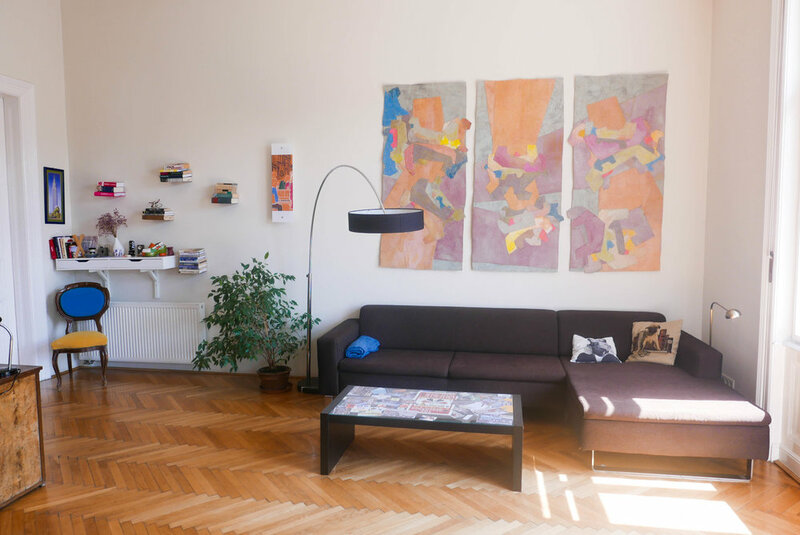 The flat Pest is the newer and once poorer side of the city, while the hilly Buda is the old town and richer area. Although apparently less so these days. Our Air BnB was located in a convenient part of Pest, just over the river by the Margaret bridge. 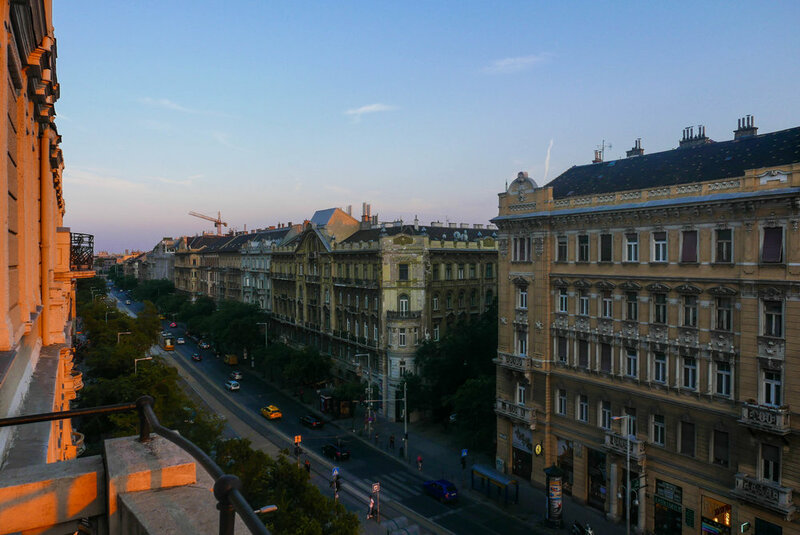 We were lucky to have stunning views from our balcony across the river and down one of Budapest’s main streets. We were on, you guessed it, the fourth floor. The apartment had been refurbished by it’s lovely owner Daniel, who gave us a great welcome when we arrived. He showed us some of the original parts of the building he had uncovered during the renovations which he had kept, including bricks with the soviet symbol on them. Daniel works in a creative field. It showed in the apartment. 1. Exploring the city – as we had done everywhere else. 2. The Sziget Festival – a 7 day music and arts festival on an island in the middle of the Danube, about 3Kms from where we were staying. It was kind of like living two lives, Budapest by day and Sziget by night. All up we were there for 10 days and by the end we were both exhausted. We took one of our obligatory free city tours to learn about the city and get our bearings. This took us first through Pest, then Buda. Our guide was great at explaining the history of Budapest, which at various times has been under the rule of some empire or another. Mostly the Ottoman Empire and Austro Hungarian Empire. We learned that Hungary was once much larger than it is now, including parts of the current Slovakia, Croatia, Serbia, Austria, Romania and Ukraine. It even had a coastline. It’s worth checking out this map here http://www.euratlas.net/history/europe/1400/index.html and clicking through the different centuries to see how the region’s borders changed. Budapest was relatively lucky compared to other cities in Europe, as it was mostly left alone during a number of conflicts – particularly WWII. 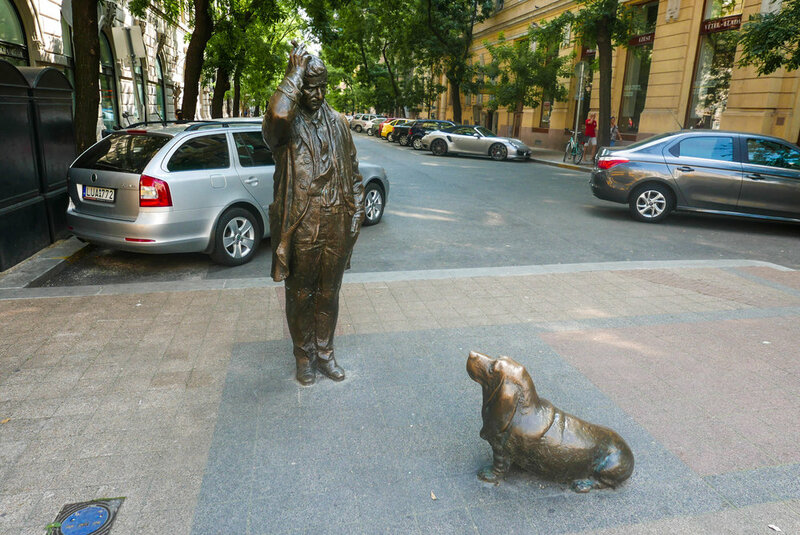 While under Soviet rule from the end of WWII until 1991, it seemed less affected by this than say Prague. However we did see similarities between the two cities. Anyway, enough with the history lesson. 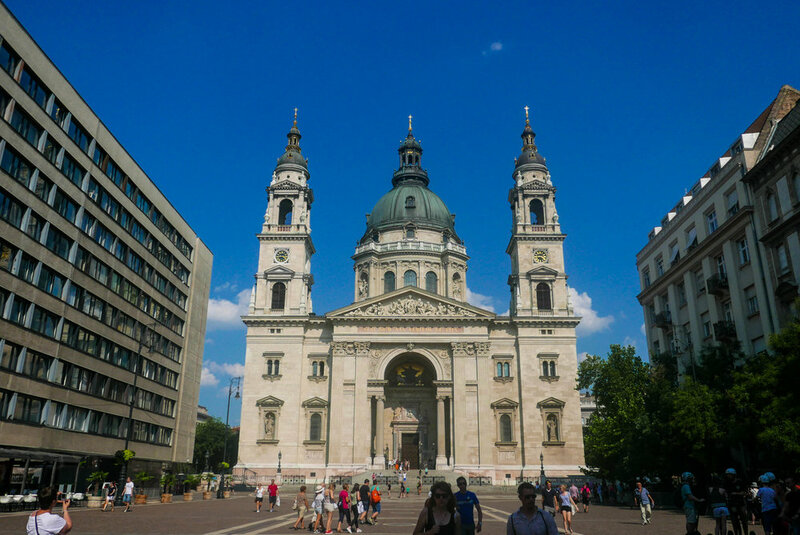 On the tour, we also checked out the Pest side, including the outside of the Royal Palace, Fishermans’ Bastian and Matthias Church. Budapest is quite a large city and we spent a bit of time just wandering around getting from A to B. It also has a great tram system, as many cities in Europe do (sorry Melbourne, we’re not as special as people would have you think). 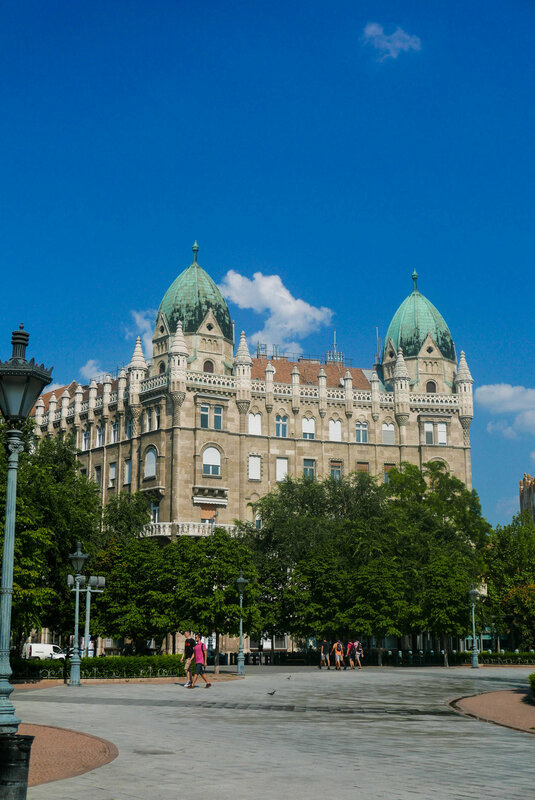 One of the main tram routes takes you along the Danube and past some pretty spectacular sites, once of which is the Hungarian Parliament – an absolutely stunning building. We also got the opportunity to see this from the water one night catching the ferry back from the festival. It looked like a palace, all lit up and reflecting on the water. Market: This huge local food market is where many Budapest folk go to do their shopping. It was amazing how many deli like stores selling mostly meat there were. So much salami. I don’t know how they all stay in business. Here we also tried a Hungarian speciality, Langos – a deep fried bread covered with toppings. Delicious, but you could taste the calories. Bath houses: A trip to Budapest would not be complete without a visit to one of it’s many bath houses. Pretty much the whole of Budapest sits on top of underground natural springs. Due to this and the Ottoman influence, there are many around the city. We tried two, the first Széchenyi. This one had a couple of outdoor pools and a large indoor complex. Looking back going to one with a pool was probably a mistake. Half of the Sziget goers were here the day we went, many of whom were camping at the festival and were probably going there for there first wash in days. Yuk. The water did not look inviting, but it was nice all the same. We just felt like we needed to give ourselves a good scrub afterwards. The second we tried was Rudas. This was much much nicer. The main part was built in the Turkish style. This one large, dark, domed room housed five different pools of varying temperatures. It also had a new part which was light and bright and even had an outdoor pool looking across the Danube and a whole section of different saunas. I loved this place. I reminded me of the onsens and sentos we used to visit in Japan. I happily spent a few hours at this place on two occasions. Prior to the spas I had been having issues with my feet again. The waters of the spas are supposed to be healing and I’m convinced they fixed me up. Bar Tour: The other major touristy thing we did was head out for a bar tour. Budapest is becoming well known for its nightlife – particularly in the old Jewish part of town. Many old buildings have recently been bought up by savvy entrepreneurs and converted into what they call ‘Ruin Bars’. The first one that was built, Simpla, is actually a pretty cool space with all kinds of weird and wonderful decorations, but most of them seem pretty much standard warehouse conversation type things. I think being from Melbourne we’re used to this, but they think it’s pretty special. On the tour we saw four different bars and sampled a few different shots. One of which was the rocket fuel that is Palinka. Palinka is their local spirit. Made by pretty much anyone and everyone, it comes in varying degrees of potency and usually tastes like burning. You get used to it after a while though. I don’t think I drank that much that night, but did not feel too crash hot the next day. I blame the Palinka. 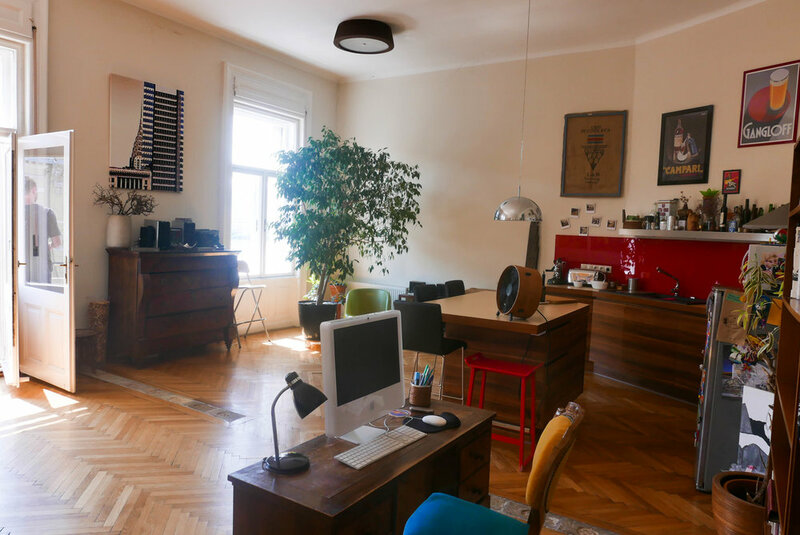 Escape Room: One thing we had to try while in Budapest was an escape room. Our friends Ashlee and Fraser had told us about these after their trip to Europe and Budapest is supposed to be one of the places to do them. An escape room is a kind of experiential game. You pay to be locked in a themed room filled with puzzles, problems, mind games and skill testers for you to solve in some kind of sequence in order to find your way out within an hour. They are the best fun. I am addicted. We did an Alice in Wonderland themed room and managed to escape with about six minutes to spare. I think it’s a good test of a marriage. Can you cooperate and escape from an escape room within the allotted time and remain talking to each other. I’m happy to report we passed with flying colours. Meeting Brent: Due to the wonderful world of Facebook, I one day managed to discover that a friend of ours we had met at Tim’s stepsister’s wedding last year, was also in Budapest. Small world. We met up for breakfast at a cafe called My Little Melbourne. It was great to catch up with someone from home. Although it was funny, given the wedding was in Fiji, we realised we’ve hung out more in other countries than we have in Australia. Food: One of the really nice things about the food in Budapest was the variety. It really felt like Melbourne in this respect. We had some great meals, including Thai, Mexican and Middle Eastern. It was a nice change as we haven’t found a lot of good international food in Europe. Out favourite was probably the little Thai place just down the road where we at three times. We had been craving some good spice and this place was the first place in Europe we’d found it with sufficient heat. One very important thing that should not go without mention is that IT WAS MY BIRTHDAY! I’m glad that at 32 I still get excited about Birthdays. I hope I always do. Tim and I went out for a yummy breakfast and then in the afternoon I treated myself to a massage at a beautiful spa. It was a very relaxing day. It was all topped off in the evening at Sziget when we saw one of my favourite artists, Florence and the Machine. The Sziget Festival was a big part in the planning of our trip. When we found out about it we actually re-jigged our itinerary to fit it in. This thing is epic. Other than Fuji Rock, it makes all other festivals I’ve been to seem mini. 70,000 people flock in every day. I think it’s supposed to be one of the biggest festivals in the world across the seven days. There are many many stages. Big ones, little ones and featuring all different kinds of music. We mostly spent our time at the main stage, the large indoor tent stage (this Big Day Out Boiler Room) and the World Music stage. Aside from the music, there are also a whole bunch of other things to see and do: Dance performances, street theatre and art, markets, circus, bungee jumping, a lumiarium, areas dedicated to not for profits and interesting organisations sharing what they do, all kinds of food and drink, a beach and so much more. We tried to stay away from the festval during the day as the music didn’t really kick off until late arvo and it got a bit much if you were there for too long. With the heat it got incredibly dusty – to the point where it was quite unpleasant. However we still managed to do some see a lot of great music and some really interesting other bits and pieces. On the music side we saw: Florence and the Machine, Robbie Williams, Kings of Leon, Jose Gonzales, Avichi, LaBrassBanda, Major Lazer, Irie Mafia, Jungle, Alt-J, Foals, Knife Party, Anna Rune, Marina and the Diamonds, Rudimental, Martin Garrix and probably many more that we passed by. Florence and The Machine – who put on an amazing, energy filled show. She is amazing. I love her. Robbie Williams – he has to be one of the best performers going around and so funny. I loved it when he asked who from the audience was over 30 and under 30, then proceeded to tell the under 30s who he was and give them a run down of his history – including his times in and out of rehab. Major Lazer – Considering it’s really just a DJ doing the music side of things, these guys put on a show. Dancers, MCs, guys getting into blow up balls and walking over the crowd and so much energy. They know how to get the crowd going. Jungle: I love Jungle’s music as it’s a bit different to anything out there right now. They are also great musically and didn’t disappoint on this occasion. They were playing in the unfortunate tent venue, which had the most awful sound of any of the stages and they still sounded good. Zen del Sur: Heian – This Spanish dance company put on a beautiful show with two dancers, a cellist and a percussionist, combined music, acro dance and circus. Fuerza Brutat – Giant Street Theatre: This Argentinian act was probably one of the highlights of my festival. To begin the show you are let into a kind of arena. Then some performers begin drumming and singing this kind of frantic song/chant. The performance happens all around, but mostly above you. It started with people flying in on ropes, suspended from a structure above. As the show proceeds, the whole audience is covered by a large parachute type cover, then a large plastic bubble, performers walk over the top and drop in suspended through holes, they take audience members up through the holes with them, people fly in wind tunnels, there are lights, fans, music, you are immersed. Then it is all removed, you are left with the drummers from the start and to finish, half the audience gets showered with water. It was an assault on the senses in the best kind of way. I was in awe the whole time. Simply amazing. One of the most engaging shows I have ever been a part of. Both Budapest and the Sziget festival were experiences to remember. I love Budapest and could see myself spending more time there quite happily. Sziget was full on, by I’m so glad we moved things around to go. By the end of it all, I think we both felt we needed a holiday from our holiday, but at the same time richer for the experience.